Being as it would be impractical to purchase a large, noisy, fuel-powered generator for a quiet camping trip in a small car, and also wanting to be eco-conscious, I was eager to find an adequate off-grid power solution. My research directed me to Goal Zero’s on-the-go solar panels and batteries. As a super environmentally-conscious solar power supporter, I so wanted to love everything about them — and I’m happy to say I came very close. Read on to discover our first experience with solar-powered camping and find out what wasn’t quite perfect about the particular setup we chose. It’s no secret we love camping, but I haven’t yet mentioned my obsession with eco-friendliness here on the blog. Recycling. Biking. Choosing long-lasting quality products over cheaper alternatives. There’s a lot we do to try to keep our carbon footprints small, so I was very excited about testing out a solar power option for camping. At $660 all in, the price isn’t much higher than what you’d pay for a small fuel-powered generator. And it offers some big advantages: it’s silent, more compact, and the fuel (sunlight) is free! Note: This was a laptop-free trip, but for future trips we’d probably want an additional Boulder 30 (or the more powerful Nomad 100 Solar Panel) to power both of our laptops. This particular camping trip was at a festival, so our power needs were a bit different from our typical wilderness camping trips. After using this setup for a full week of off-grid camping in the Nevada desert, we got a good feel for what’s awesome and what could still be improved when it comes to on-the-go solar power. We started with a full battery, and our Yeti only ever got as low as 40% during the week, which happened after a couple days with periodic clouds, dust, and haze. The week was much cloudier overall than we’d expected, and we spent minimal time re-aiming or dusting off our panel (which we didn’t even bother to try at all for the first four days). One Boulder 30 panel will fully recharge the Yeti 400 in 26-52 hours. You can chain a second panel to cut that time in half. For us, the 12V power port on the Yeti was useless. It would have been more useful to have more USB power slots instead. Two AC power outlets — You can actually charge your laptop (or panini maker, hair straightener, or any other appliance that draws up to 300W of power) with the Yeti 400. USB power outlets — Use for charging two USB devices at a time. Clear instructions — You don’t have to read a ton of material to understand how it works. Reasonable to transport in your car — The Yeti 400 isn’t lightweight, but it’s got a handle, and it’s more compact than fuel-powered generators (about 1/3 of the size of the smallest ones available). The Boulder 30 panel is light enough for very easy transport by car. No fuel required, as with standard generators, and it makes no noise! Real-time charging rate display — The Yeti 400 gives you a constant read-out of your power input from your solar panel, so you can tell if it’s aimed well (as directly as possible to the sun). Real-time power use display — It also tells you your power output, so it’s easy to determine if you’re using power faster than you’re re-charging your Yeti. Three ways to re-charge — You can charge the Yeti 400 by wall outlet (5 hours), 12v car adapter (13 hours), or solar panel (26-52 hours). Panel-chaining option — If you want to charge the Yeti faster, you can attach additional panels. Up to four Boulder 30s can be chained at a time. Emergency power — If you keep it charged (as recommended), the Yeti 400 alone would provide a great backup solution for unexpected power outages at home. You can’t take this setup backpacking. The Yeti 400, while lighter and much more compact than a traditional fuel-powered generator, is still bulky and heavy — similar to the size and weight of a car battery. You have to remember to switch off charging sections of the Yeti 400 when you’re not using them in order to not drain your battery unnecessarily. A solar panel unfortunately won’t re-aim itself, so as the angle of the sun changes throughout the day, you need to re-aim the panel if you want to keep charging your battery at its optimal rate. The Yeti 400 also requires a (tiny) bit of babysitting while you’re not using it. It must be re-charged, at a minimum, every three months. Goal Zero recommends keeping it plugged in if you can, so the battery stays healthy and it’s ready to go at all times. The Boulder panels aren’t as packable as I’d like. While the weight is reasonable for car camping, they’re built strong and rigid, and I think the frame adds unnecessary bulk. I really prefer the foldable Nomad panels, but I wish Goal Zero offered one in between the 20W and 100W sizes. The 20W is just too little power and the Nomad 100 costs nearly four times as much. It’s a great car camping power solution, but I’d choose their more compact/portable panel design. 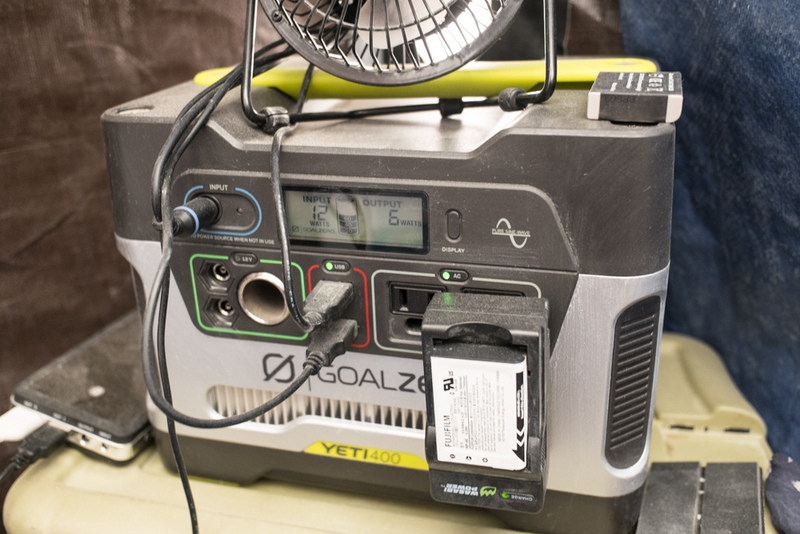 The Goal Zero Yeti 400 battery + Boulder 30 panel combination is a great option for those needing a reliable power solution in a sunny, off-grid, car accessible place. We tested this setup and it performed completely adequately for the frequent recharging of several devices and batteries during our mostly sunny week in the desert. Our Yeti 400 never dropped below 40%. 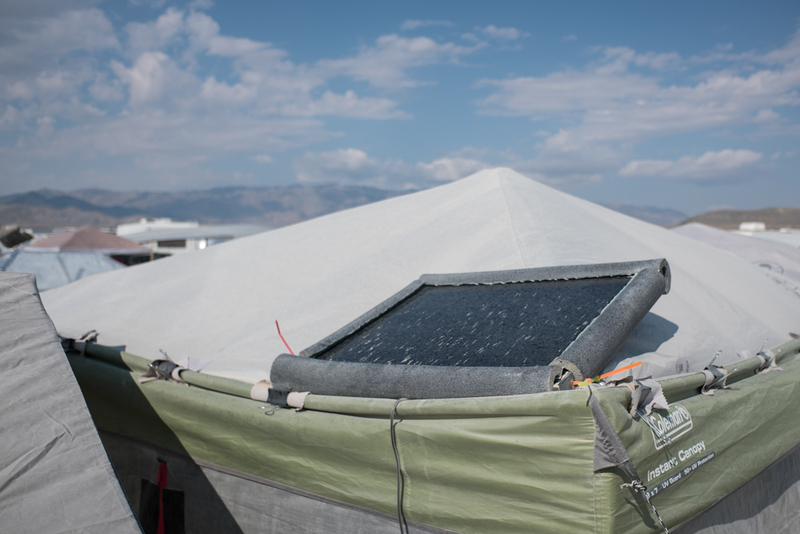 For anyone planning to be off-grid for a longer period of time, with less predictable sunny weather, or needing to re-charge devices more frequently, we’d recommend considering a larger panel or more panels so you could recharge the Yeti at a faster rate. 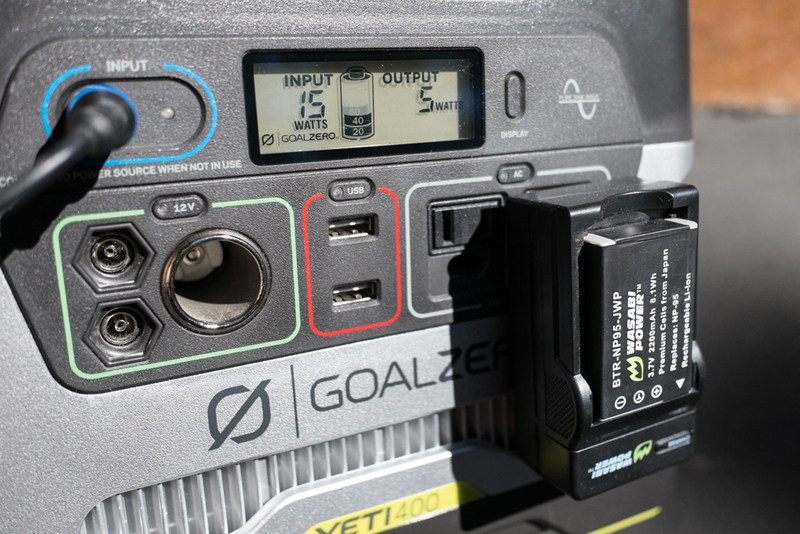 See how fast the Yeti 400 charges with different solar panels and how many times you can charge your devices on Goal Zero’s website. 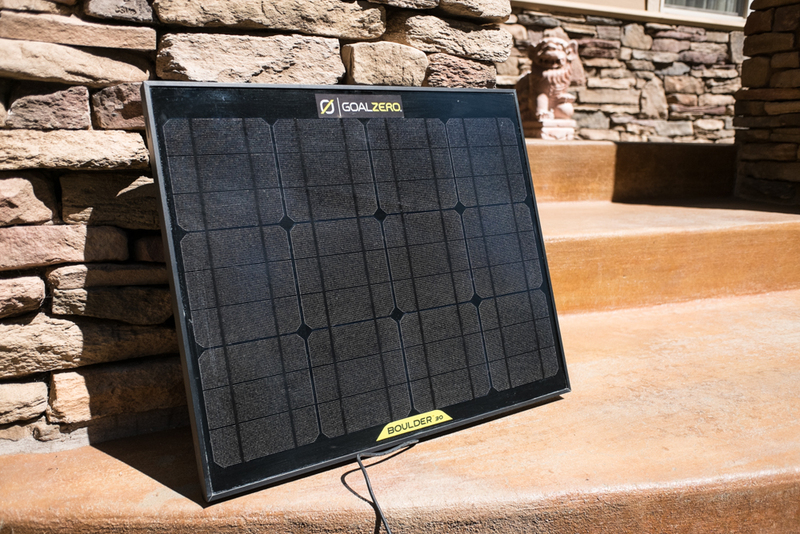 I think one of the most clever things Goal Zero offers is the ability to chain multiple panels together to customize the amount of solar charging power you need. Two compact Nomad 20s can chain together to give you 40W, two bulkier Boulder 30s can chain to give you 60W, etc. Since we typically travel with two MacBooks in addition to our other devices, we’d want at least a 50W or 60W panel to pair with the Yeti 400. Unfortunately a compact solution doesn’t exist at that power level. Space is precious in our Yaris, and two Boulder 30s would just be too big for the amount of power we’d get. The Nomad panels Goal Zero offers are more packable and space efficient, but the size offerings for these foldable panels jump straight from 20W ($199) to 100W ($749). The Boulder 30’s rigid, less-portable design isn’t a perfect match for us, especially since we’d need two. After this experience and considering our long-term power needs, I’ve reconsidered the Goal Zero solar options. Considering size, portability, battery capacity, the fact there are TWO of us with our own laptops and devices, and the current options available, my choice combination would be the Yeti 400 and Nomad 100. 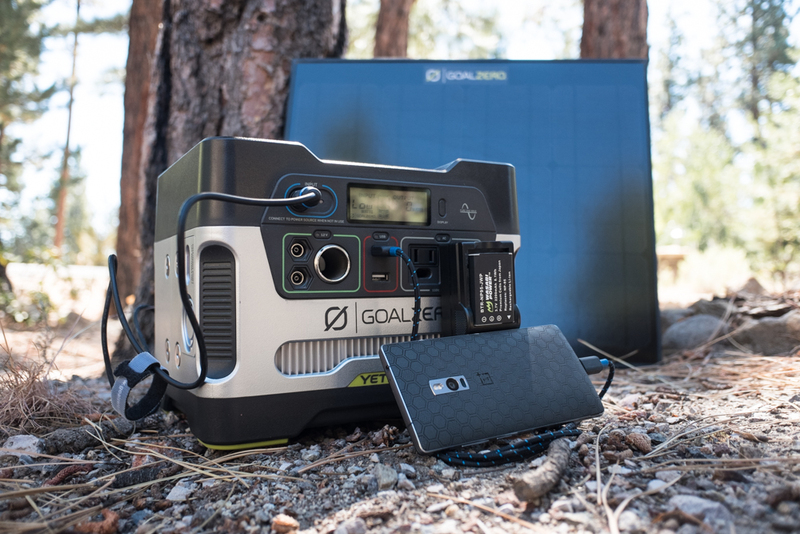 This combination would offer a reasonably compact and portable solar solution, perfect for both working while camping and for backup power at home. The Nomad 100 (20.5 x 15.5 x 2″) is smaller overall than two Boulder 30s (21 x 18 x 2″), provides 40W more power, and costs $350 more. Though I do still wish there was a 50W portable panel offered to make the investment a little more affordable, given the current options I’d be happy with the Nomad 100. Not only can you charge small devices directly from the panel, but it’s also important to remember that direct sunlight isn’t a constant. By having some extra charging capacity, I could be more confident that this panel would recharge the Yeti as fast as we’d be using it. If you have different energy needs from ours, Goal Zero offers several solar generators with different capacities as well as both rigid and foldable (more portable) solar panels so you can customize a solar solution for you. Solar charging kits are available as well. Do you have experience with solar-powered camping? What setup do you use? Let us know in the comments below!